We are a leading stock broking and wealth management firm, headquartered in Hanumansthan Anamnagar-32, Kathmandu. We operate on a unique retail focused stock trading model that provides revolutionary trading platforms and expertise to a diversified client base. Founded in 2010. Imperial Securities Co. Pvt. 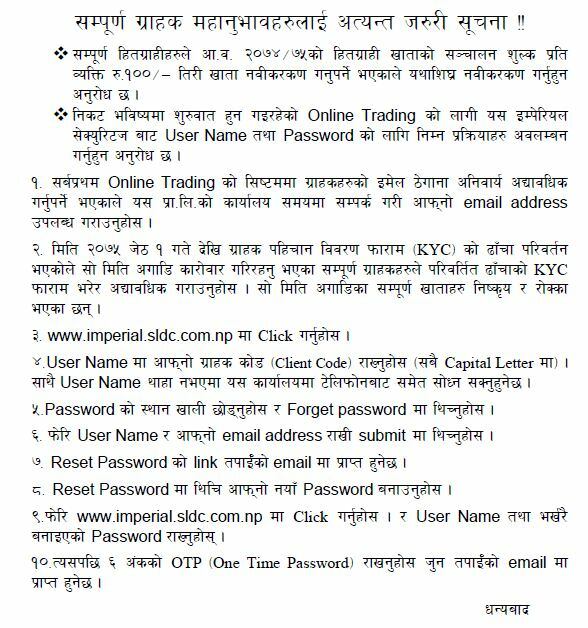 Ltd is Member Of Nepal Stock Exchange (NEPSE), We are also registered as a Depository Participant with CDSC. We extend our earnest greetings to you all on behalf of the Imperial Securities Company Pvt. Ltd. We feel most delighted at the moment to reach out to a broader populace via the Imperial’s own and well updated website. Although we have always been committed to keep our esteemed customers informed through various other media, we believe we shall together achieve yet another milestone with our fresh endeavor. Imperial Securities Company Pvt. Ltd.is one of the leading stockbroking companies and wealth management firms headquartered at prime location of Anamnagar, Kathmandu. Founded in 2011, we operate on unique retail focused stock trading model that provides revolutionary trading platforms and expertise to a diversified client base. Imperial Securities Company Pvt. 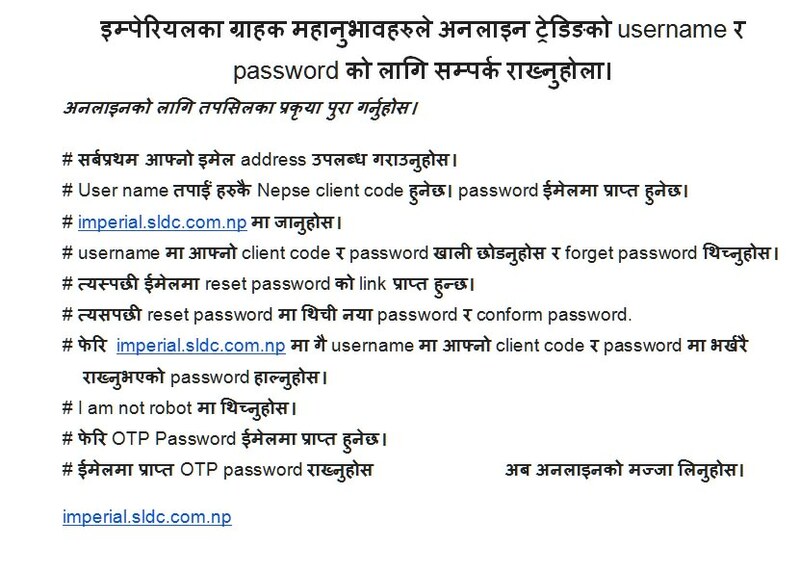 Ltd. is member of Nepal Stock Exchange Limited (NEPSE) and is also a registered Depository Participant (DP) with CDS and Clearing Limited (CDSC). Imperial Securities Company Pvt. Ltd. aims at attaining a treasured space and enduring trust towards the company among our existing and prospective customers in the arena of stock broking business. Its obvious matter of fact that investment in the stock market these days has been one of the most lucrative businesses for the investors even the markets like Nepal’s. It cannot be denied that the investors may have to bear unnecessary stress and burden due to lack of timely and proper intermediary service. At this point, we also aim at adopting best responsibility towards stakeholders in order that our clients would get the most assured professional services. We see ourselves as a family of honest, loyal and committed professionals with the technology, innovation and human touch to achieve high degree member's satisfaction and good will. We understand that the progress and prosperity of our investors is the ultimate key to our success.We have opened the new avenue with an objective to bring the best of national and international practices and technologies to Nepal and sharing them with our stakeholders so as to make a collective benefit out of it. 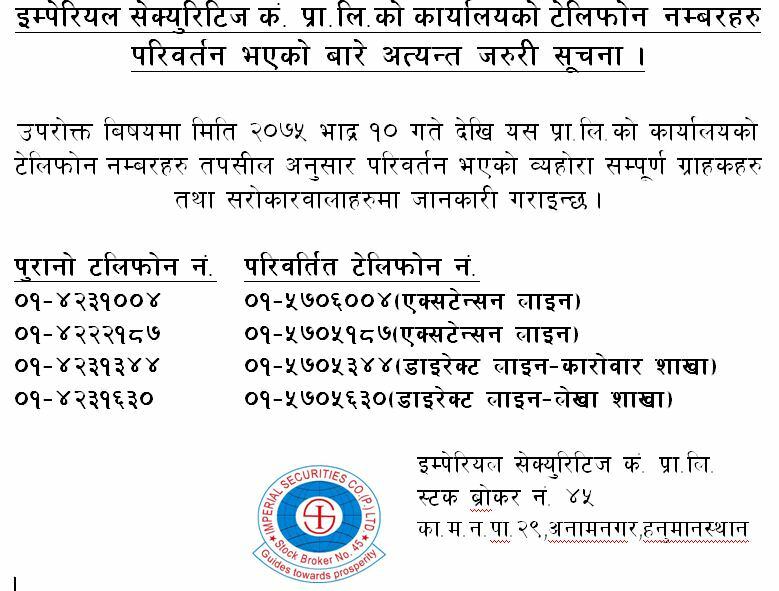 We will have more scope to play in the days to come with the recent membership of Association of National Numbering Agencies (ANNA) to CDSC and International Organization of Securities Commissions (IOSCO) to Securities Board of Nepal (SEBON) as these events have given the recognition to Nepalese stock markets in the international arena. Any successful organization is often defined by certain core characteristics, such as proficiency, novelty and a passion for serving to its customers and stakeholders. These same words fittingly define the Imperial Securities, a distinguished and leading stock broking company for which I have the privilege of serving as Chairperson of the Board. It gives me a profound happiness to state that we have been one among the top five most trusted stock broking company in Nepal and express my strong commitments to march ahead as the market leader soon in the days to come. We acknowledge that our clients, partners and shareholders are the true assets of our company. 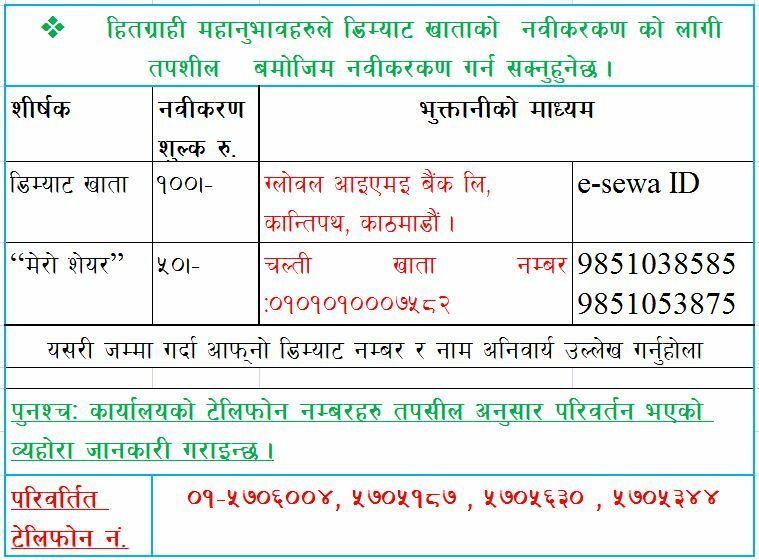 On behalf of the Imperial Securities, I extend our profound gratefulness to the Ministry of Finance, the Office of the Company Registrar, SEBON, Nepal Rastra Bank, NEPSE, CDSC, Auditor, Legal Advisor and other bodies for their unceasing direction, assistance and contribution in our journey till date. Moreover, I bestow my special thanks to all the dedicated staff of the company for their contributions. At the moment, I hope we shall achieve an eminent success through our unflagging joint efforts in the days to come. Imperial Securities Company Pvt. Ltd. is one of the leading stock broking companies and wealth management firms headquartered at prime location of Anamnagar, Kathmandu. Founded in 2011, we operate on unique retail focused stock trading model that provides revolutionary trading platforms and expertise to a diversified client base. Imperial Securities Company Pvt. Ltd. is member of Nepal Stock Exchange Limited (NEPSE) and is also a registered Depository Participant (DP) with CDS and Clearing Limited (CDSC). Imperial Securities Company Pvt. Ltd. rendezvous with excellence in customer relations has emerged as one of the most trusted and respected stock broking companies in our domestic context. Imperial, as the name of the company suggests being something majestic, vows to keep its customers contented with its superlative trustworthiness and professional pragmatism. After obtaining the Letter of Intent from the Securities Board of Nepal (SEBON), Imperial Securities Company Pvt. Ltd. set up the necessary infrastructure and involved in availing the stock broking related services to its valued clients by complying with the necessary conditions as specified by the governing agency. Imperial Securities Co. Pvt. Ltd tryst with excellence in customer relations began in 2010. Today, Imperial has emerged as one of the most respected stock broking and Wealth Management Companies in NEPAL. With its unique retail focused stock trading business model, Imperial is committed to providing ‘Real Value for Money’ to all its clients. To provide best value for money to investors through innovative products, trading/investment strategies, state-of- the-art technology and personalized services. To provide the best quality service to have complete harmony between quality in process and continuous improvement to deliver exceptional service to delight our clients thereby contributing to the capital market of the country and create excellent market growth opportunity for our employees. To have complete harmony between quality in process and continuous improvement to deliver exceptional service that will delight our Customers and Clients. Our Motto Is “Guides Towards Prosperity”. A stockbroker, also called a Registered Representative , investment advisor or simply, broker, is a professional individual who executes buy and sell orders for stocks and other securities through a stock market, or over the counter, for a fee or commission. Stock brokers are usually associated with a brokerage firm and handle transactions for retail and institutional customers. Brokerage firms and broker-dealers are also often referred to as stock brokers. Imperial Securities Co. Pvt. Ltd as an intermediary of Depository System (CDS and Clearing Ltd.) provides Depository Participant service to our valued clients. As a DP, we facilitate our clients to open Beneficiary Owner (BO) Account to deposit all their share certificates in paperless and hassle free format. To ease our clients, investors can open Demat Account and Dematerialize their shares. Additionally, to keep abreast with their investment, we provide Online Demat View Service to our clients. If You Buy or Sell Multiple Companies with Multiple Transaction you Should Input the the quantity seperated by Comma(,). with corresponding rates separated by comma (,). 50,200 in quantity and 100,200 in rate. If these are shares of different companies then write no of companies 2 else write no of companies 1.